The WELD-PAD enables the measurement of temperatures on plain or contoured surfaces. 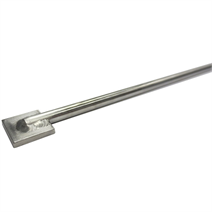 The WELD-PAD sensor hot end is a contoured weld-pad attached to a mineral-insulated cable (sheathed cable). It consists of a metal outer sheath, which contains the insulated internal leads, compressed within a high-density ceramic composition. The internal leads are made from thermo material. The material of the outer sheath can be selected to match the application. At one end of the sheathed cable, the internal leads are welded together to form an insulated (ungrounded) or non-insulated (grounded) measuring point. The WELD-PAD is designed as a contoured weld pad designed to suit each tube and sensor size. The WELD-PAD design is used in low variability applications where accuracy is not critical. It provides measurement readings for trending, excursions and tracking. When critical accuracy is required refer to data sheets TE 65.56, TE 65.57 and TE 65.59.